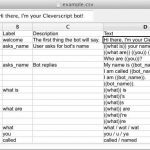 We offer access to the Cleverscript on a monthly basis. The first month is free. So you must subscribe in order to create a bot, but you can cancel within the first month if you are not satisfied.